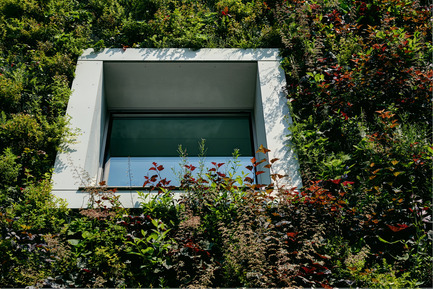 The vertical garden, covering front and side elevations, is a tool which allows to integrate the building with its green context. 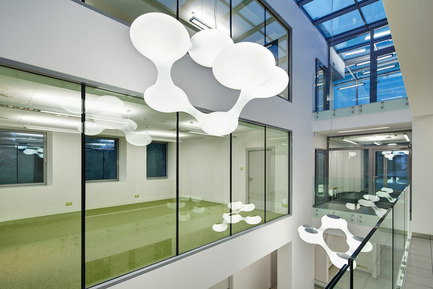 The FNP headquarters has become an element of the landscape in a very common sense. The green face of the building blurs the boundaries between architecture & nature. The architecture of the building is created by a collision of textures. 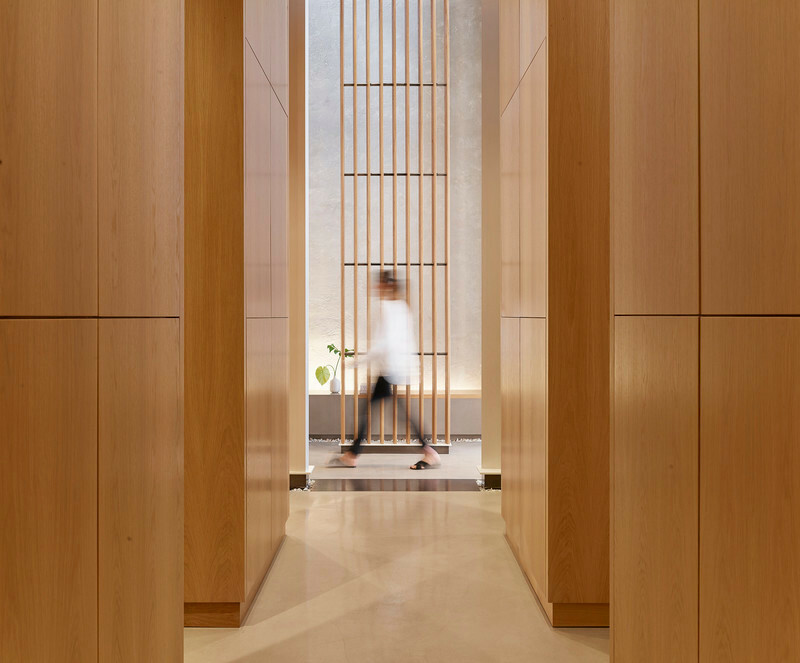 The leafy vertical garden, softening the building edges, is contrasted with the smoothness of surfaces finished with light grey concrete panels. 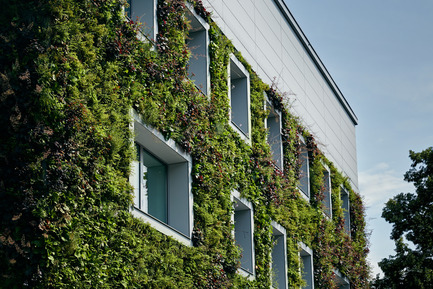 The green wall, naturally three-dimensional, is enriching the elevation with its depth. This three-dimensional effect is constantly changing over time. Due to the natural vegetation of the plants and the cycles of the year the face of the building will also be constantly changing. 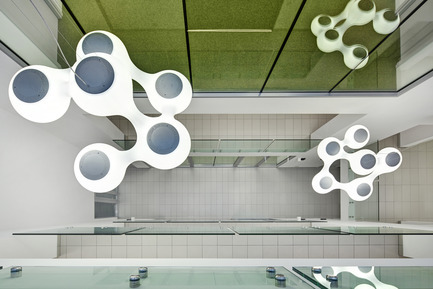 The vertical garden, taking into account its geographic location, is treated as experimental. During the course of its exploitation, the bio-diversity of the wall may change due to the seeds brought by birds or wind. The designed vegetation optimum should be reached in 2016. 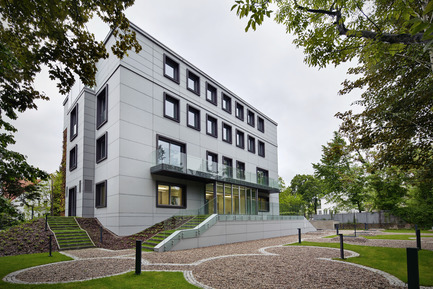 An existing, multifamily housing building has been converted into an office building to house the new headquarters of the Foundation of Polish Science. 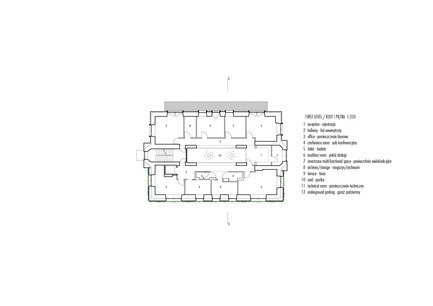 The FNP headquarters consists of one underground level and four above ground levels. The parking lot, technical rooms and archives were placed below ground at level minus 1. 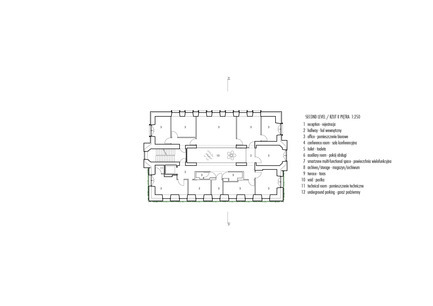 The ground level is composed of reception area, conference rooms, multifunctional spaces and offices. 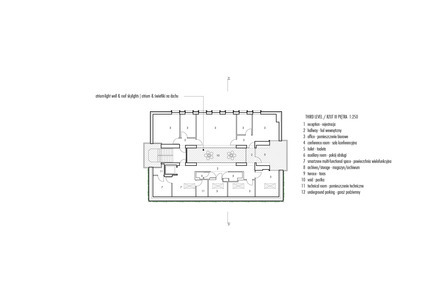 Office spaces have also been placed on the above ground levels. 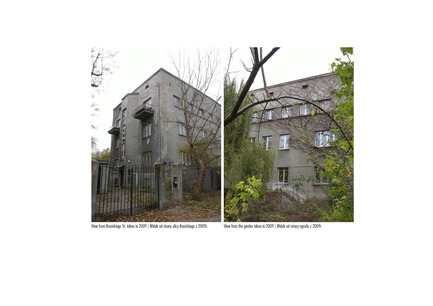 The building is located in Wierzbno, a part of the Mokotów district which is one of Warsaw’s central neighborhoods. The district was converted from farmland into town in the 1930’s. It stands among the dispersed residential villas nestled into the green. Originally built as low-rise housing in 1933, it suffered serious mutilation by air bombing during WWII. Due to the bombing it lost most of the front façade and parts of the ceilings on all levels. What remained was destroyed by fire. After the war, due to its dilapidated condition, the building was initially condemned to be destroyed. 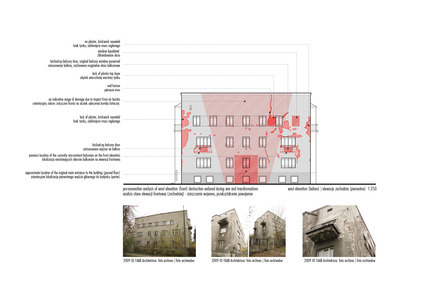 However, due to the significant destruction of the city (72% of residential buildings in Warsaw were lost as a result of the war) the demolition decision was revoked and the building was to be restored. Restoration works were carried out in a poor technical manner due to the lack of availability of quality materials. The building’s original appearance was not restored. The building is under the protection of the Warsaw Preservation Office, regarding massing of the building and the layout of windows. The proportion of the attic wall mass to the rest of the front elevation is also the subject of interest of the Preservation Office. 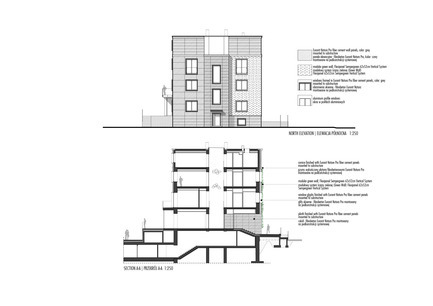 The terms of conditions for construction, issued by the municipal office, did not allow the enlargement of the building footprint. 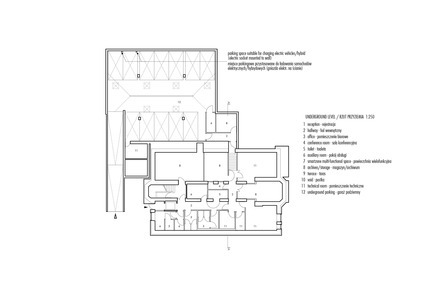 These same conditions also dictated the coordination of the new design solution with the existing character of the building, especially regarding to the rhythm and symmetry of the elevations. „...cracked walls will fall by its own weight.” “...the street front of the building destroyed with the (air) bomb, the rest of the building, roof and the 2nd level burnt down”. Inspector J.Maliszewski, 17.08.1945, regarding the present FNP Headquarters building on 20/22 Krasickiego St. The building structure demanded an extensive scope of stabilization and reinforcement including the foundations, ceilings and bearing walls. All the external wall reparations, carried out just after the WWII needed to be revamped. All of the building corners were reinforced from the outside - with the special system of steel clasps - to the full wall height. 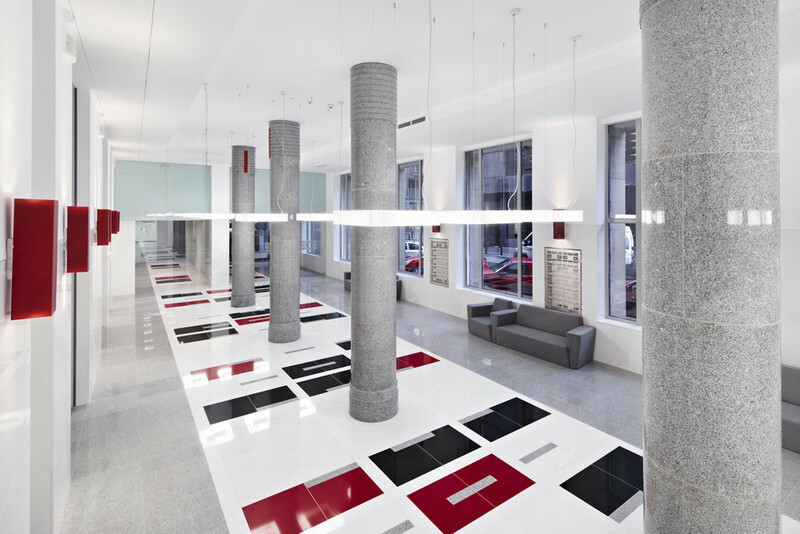 The original prefabricated terrazzo runs needed to be strengthened with the steel elements. 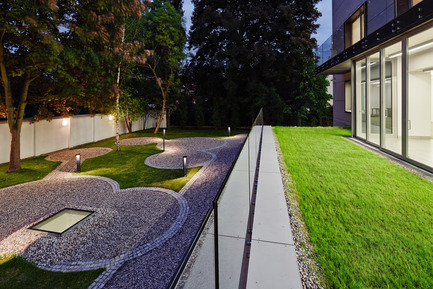 The removal of the existing fence in the building front yard helped to enlarge the public space of the street and incorporate the backyard garden with the surroundings. 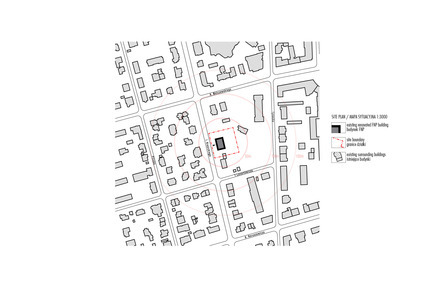 The FNP building is the only example alongside the 900m long Krasickiego Street of a building plot that is not separated with a physical barrier (fence) from the fabric of the town. 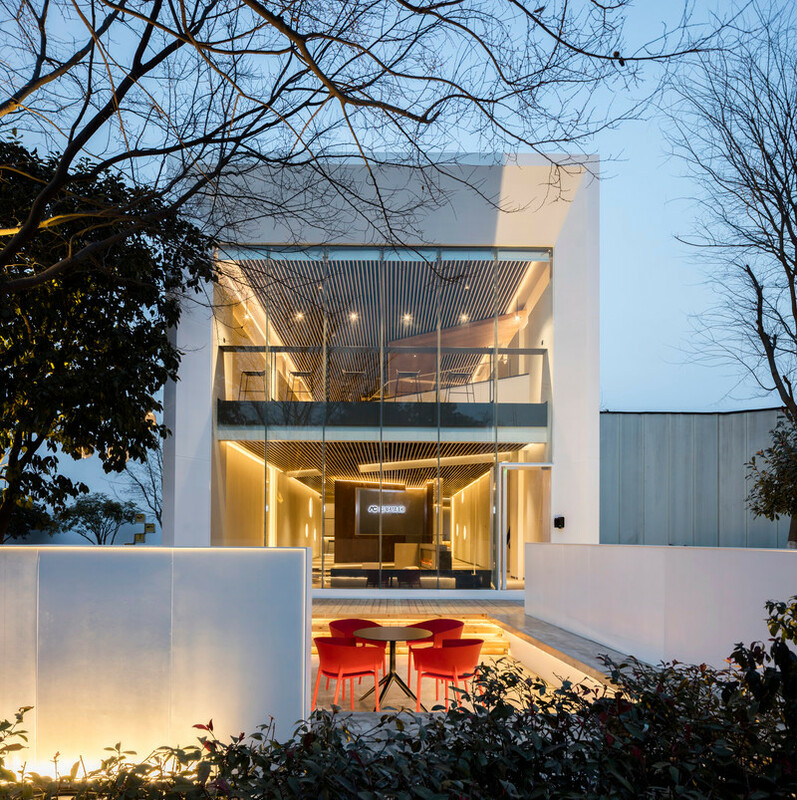 The perforation through the ground floor, beginning with the main entrance and ending with the backyard garden, establishes an additional visual link between the street and garden view. Corset tiles and the staircase. The preservation of the original staircase décor is in fact preserving a very characteristic design element of Warsaw architecture of the 1920’s & 1930’s. 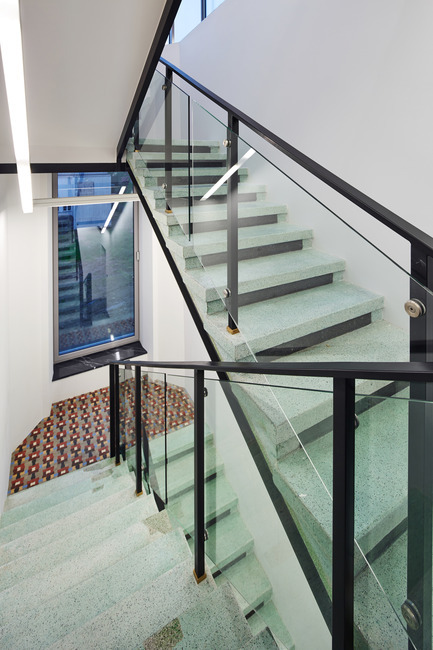 The cantilevered and prefabricated steps made of the green terrazzo are enriched by the landings which are filled with tiny, colorful and shape specific ceramic tiles known as “corset” tiles. 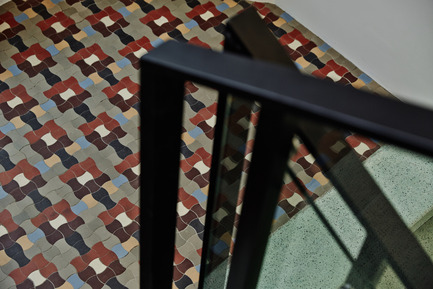 Floorings finished with corset tiles can be found in the buildings of this era almost anywhere in Europe, including Amsterdam, Paris and Brussels. Popularity of the corset tiles led to the commonness of the application in Warsaw buildings. Nevertheless, the patterns varied greatly, due to the ambition and skills of the local craftsmen. That is why each of the still existing patterns can be described as unique. The internal atrium, which carves out the “light well” to all the above ground levels, opens up the building and allows in natural light. 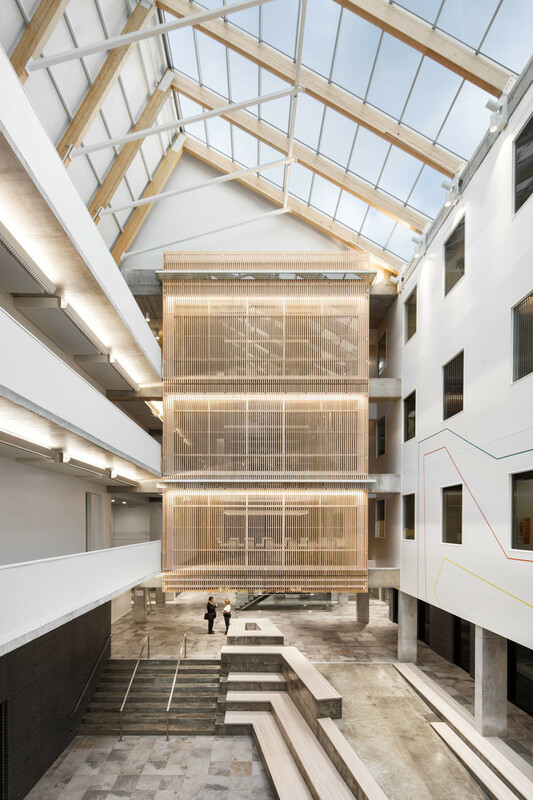 The atrium, the ground level perforation, the windows and skylights together provide access to natural light for 96% of the internal space, this including offices, corridors and common areas. 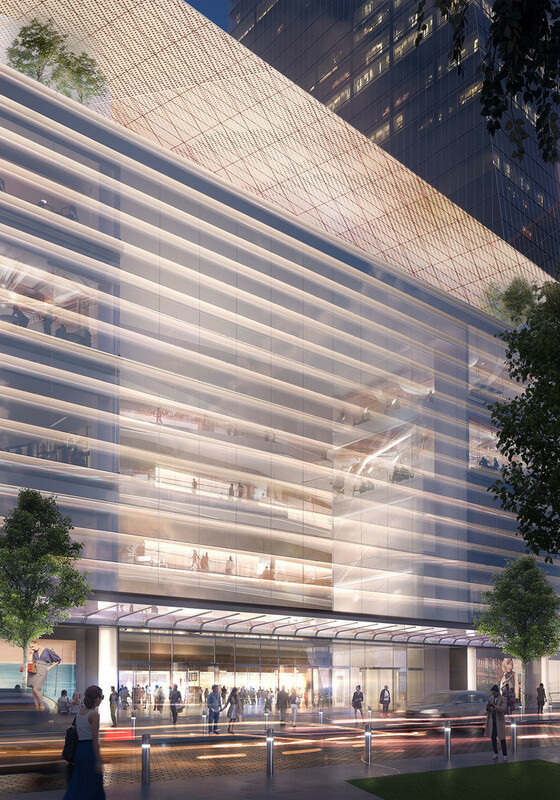 The ground level and underground parking lot (equipped with overhead skylights), reached the highest possible ratio of 100% access to the natural light. 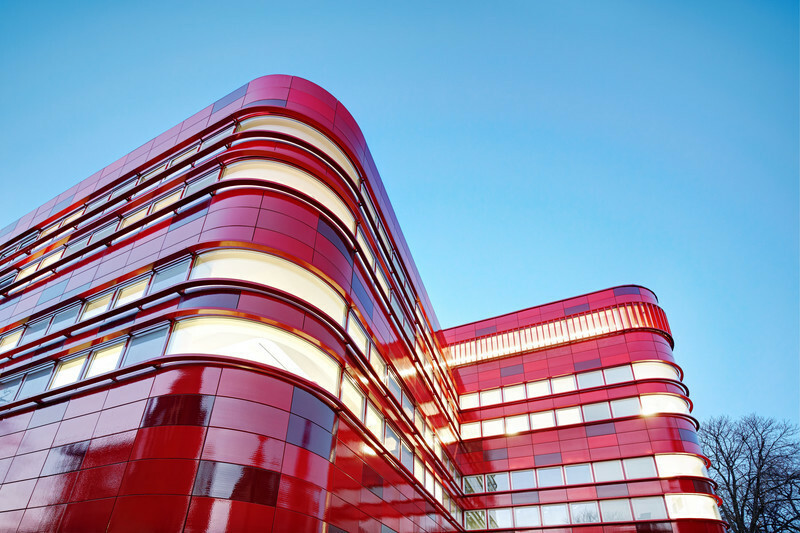 The building is equipped with devices having low energy consumption. The electrical systems have been enriched with elements that manage usage of electrical power in real time. 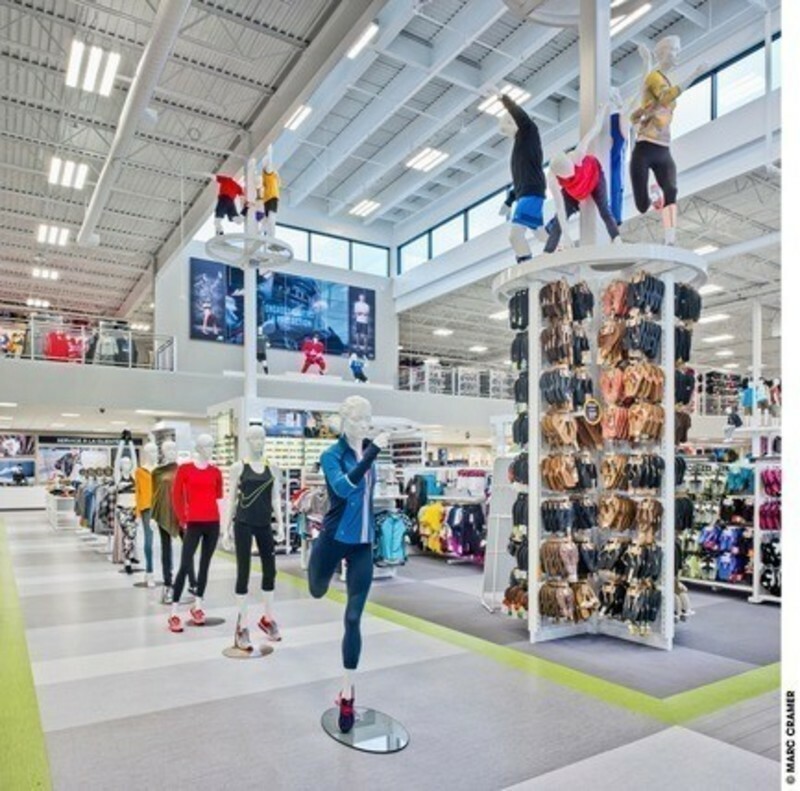 These solutions have lowered the building’s electrical demand and its impact on the municipal network in a substantial way. 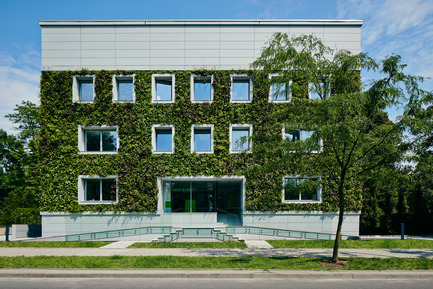 The green wall is one of the elements which creates the pro-ecological identity of the building. 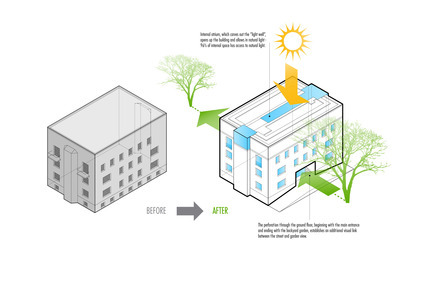 It helps to improve the energy balance and creates a beneficial microclimate inside the building. 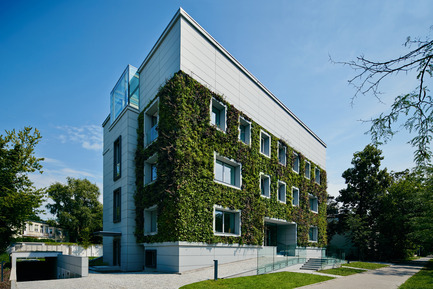 The vertical garden, applied onto the front and side elevations, gives 260 m2 of green surface area to the elevations. 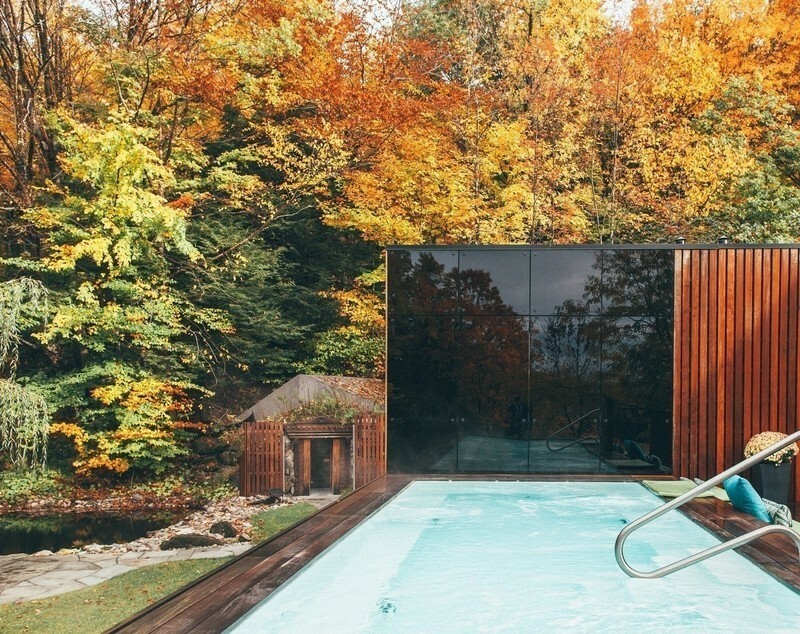 It is the only one, external garden in Poland and in this part of Europe. Within the vertical garden 20 different species of plants have been included. Some of them are to create a green background all year, while others will bloom during the warmer seasons. The plants with the decorative red fruits will add a color accent also during the winter seasons. 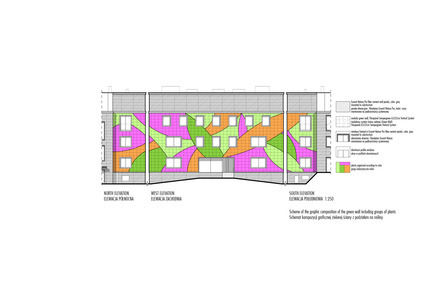 Since the placement of the plants was consulted with the architects, the manifestation of a geometric pattern should reveal itself at the end of the third year of the vegetation cycle – by September 2016. The plants are supplied with water and necessary nutrients by a special irrigation system supported with a set of sensors located onto the surface of the panels. Based on the information collected the wall is automatically irrigated and fertilized. This process is controlled in real time and can be steered on-line. 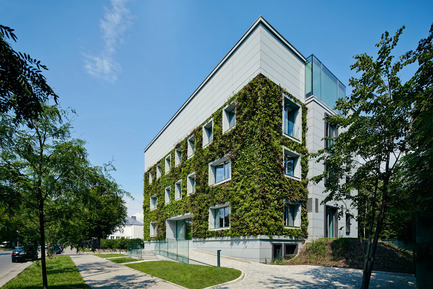 A unique mat - made of a material structure similar to that of mineral wool - is the base for the modules of the green wall. In this case, the mat is the supplement of the soil responsible for giving the plants the appropriate support. 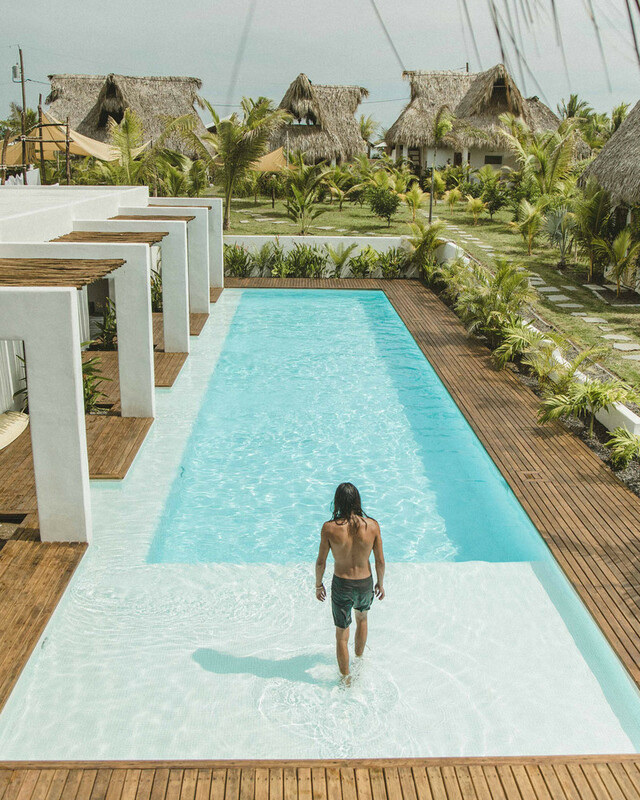 It also protects the roots of the plants from exposure to the changing and harsh weather conditions, which is essential in the climatic region in which the green wall has been installed. 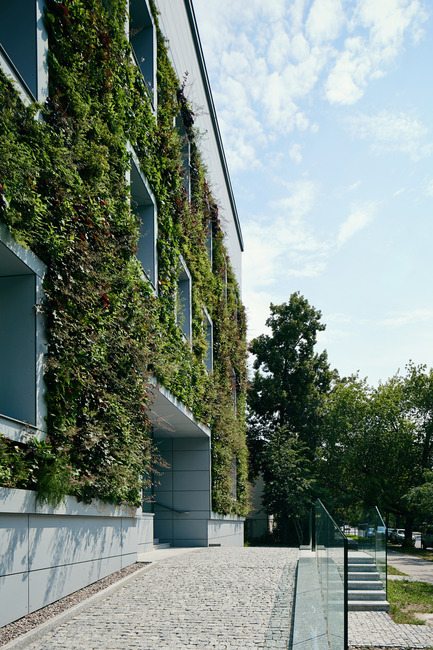 The lightweight modules are mounted to the steel substructure which makes the maintenance of the vertical garden system a relatively easy task. The plants ale placed in the specially designed pockets which helps to exchange them if necessary. 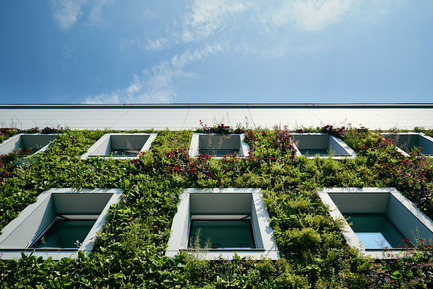 The green wall modules had to be mounted with precision to achieve the desired holistic pattern. 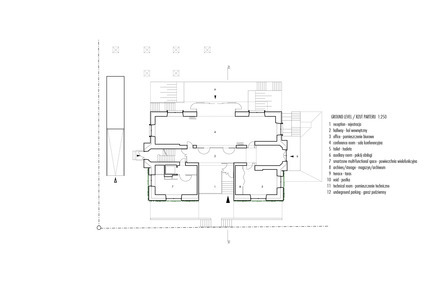 Each of the modules was marked with the exact position of its location on the wall. The substructure also needed to be built with special attention. Mainly, the slope of the wall needed to secure that the proper flow of the water will be sustained. Too large of a deviation could cause some plants to not receive any water at all while others could get an overabundance. The vertical garden, taking into account its geographic location, is treated as experimental. During the course of its exploitation, the bio-diversity of the wall may change due to the seeds brought by birds or wind. 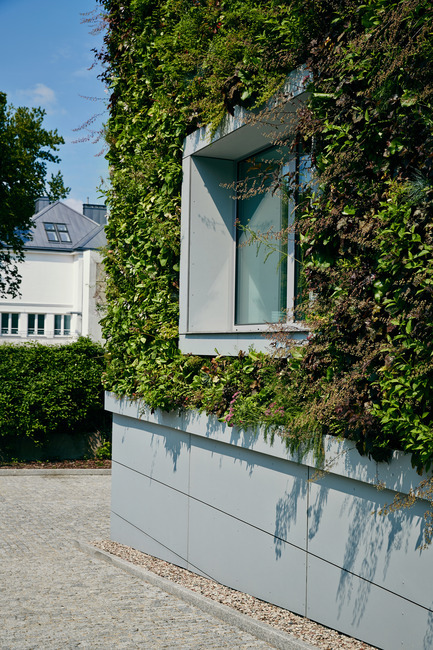 The designed optimum of the vegetation of the wall should be reached in 2016. The biologically active surface, supporting the retention of the rain water, covers almost 67% of the given site. 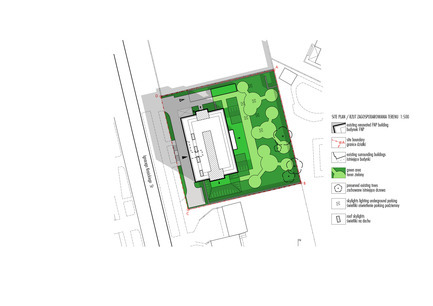 Together with the vertical garden, the green area covers 82% of the surface of the given site. The rain water collected from the roof and pavements is directed into the underground retention basin. The rain water is then used to water the green elevation. This solution helps to reduce to an absolute minimum the amount of the grey water dumped into the municipal rain network. 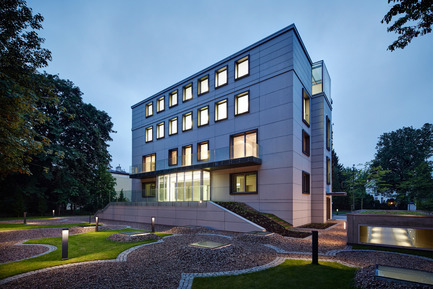 The intent of the project was to preserve of the character of the 1933 dilapidated multi-family house, which had been seriously mutilated by air bombing during WWII, while converting it into an environmentally friendly and modern office space. 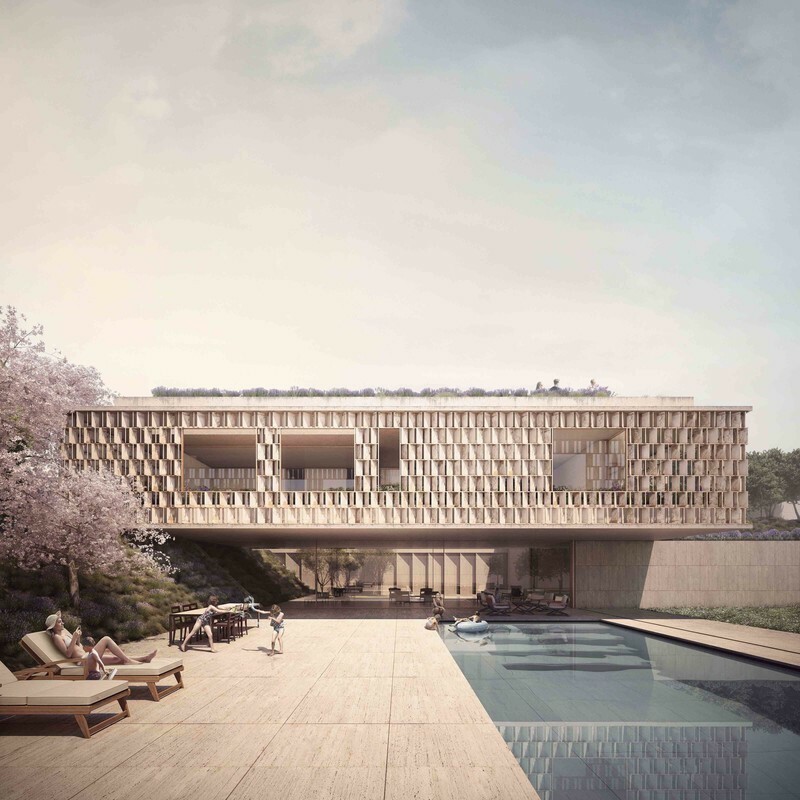 Simultaneously, precious architectural and historically significant elements were safeguarded alongside adhering to the restrains postulated by the Warsaw Preservation Office in regards to building mass and window layout. 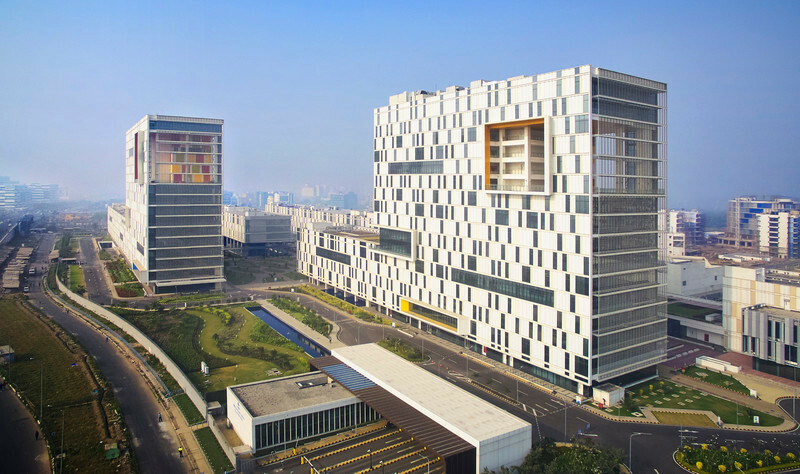 The building’s location, inside a sparse subdivision, established in 1930’s, influenced the multilayered integration of the project within the green context and public space. The investment strove to reduce its impact on the municipal infrastructure and the natural environment. 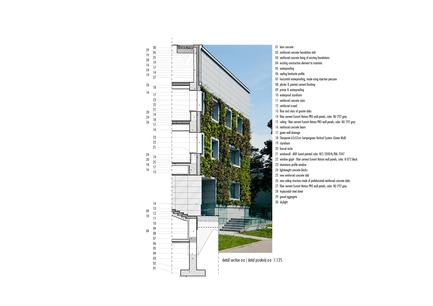 The integrating tool to connect the building to its green context is the successful application of the first in the region external vertical garden onto both front and side elevations. The rain water collected into the retention basin irrigates the vertical garden and eliminates the demand for the municipal network. An 82% of the relatively small town plot, taking into account the vertical garden, is covered with surfaces allowing natural water retention. 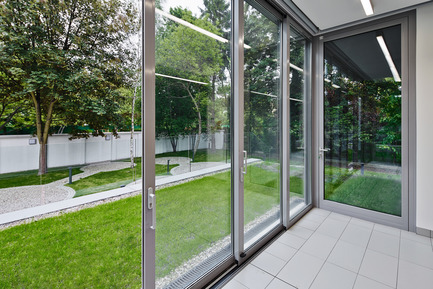 Access to natural light was given to 96% of the above ground levels space. 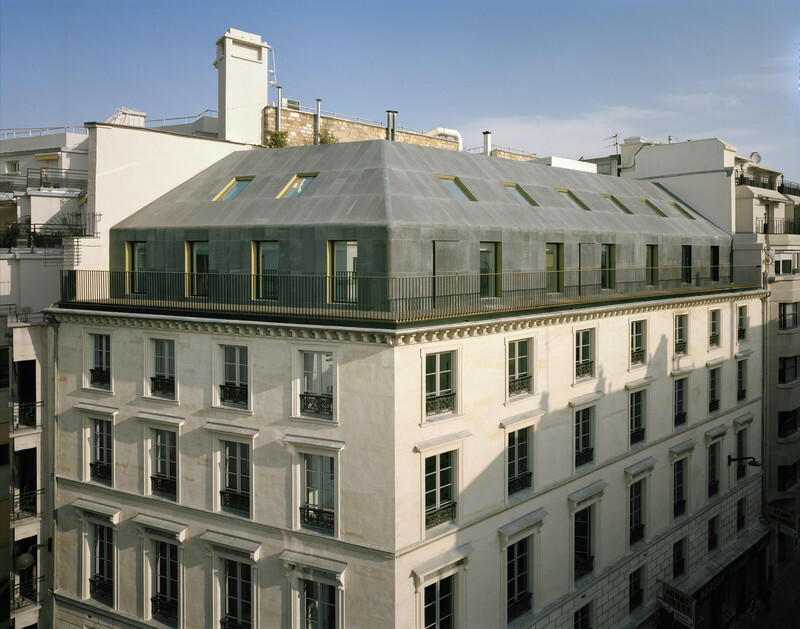 The ground level and underground parking lot (overhead skylights), reached the highest possible ratio-100% of those spaces has access to the natural light. 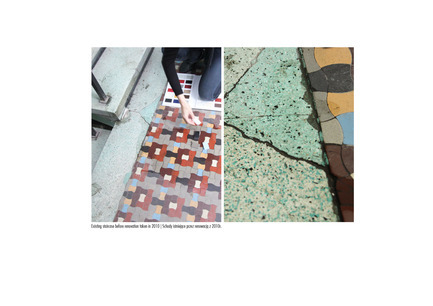 Preservation of the original internal staircase, including the green terrazzo steps and landings filled with tiny, colorful “corset” ceramic tiles (nearing extinction) recalls the atmosphere of similar buildings of the era located in Paris, Amsterdam and Brussels.